What Is Tin Lead Plating? 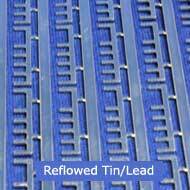 Tin Lead plating consists of the co-deposition of a layer of tin and lead onto a base part. A wide variety of tin-lead alloy compositions are used depending on the application and desired properties of the final product. Tin-lead alloys are the easiest alloys that can be electroplated. The electromotive potentials of each of the metals are almost the same, making co-deposition simple. However, control of metallic bath impurities is critical. For example, copper contaminants can cause issues with reflow and soldering, as well as affect the appearance of the plating. Therefore, it's essential that the tin-lead anodes and the plating bath be free of impurities. Hi-Tech's strong analytical capabilities are used to monitor and control all impurity levels. The presence of lead stops the formation of tin whiskers. Hi-Tech Plating produces Tin/Lead electro deposits per MIL-P-81728 (now cancelled but still in wide use), MIS-41177, and ASTM B579. Hi-Tech Plating is ISO 9001:2008/AS/EN/JISQ9100:2009 and NADCAP certified. Hi-Tech Plating offers 60/40 and 90/10 Tin/Lead alloys in either matte or reflowed form, ensuring the highest quality results. Pewter was made from Roman times until about 1700 as different alloys of tin and lead. There have been some theories that the lead from pewter or from highly leaded glass crystal was the prime cause of the decline of the Roman Empire. Pewter (tin/lead alloy) was allowed in writing in 1074 to be used instead of gold or silver in church vessels. The word solder comes from the Latin "Solidare" to make solid. The above part is a chemically machined sheet. We tin/lead plated it and reflowed the tin/lead deposit.